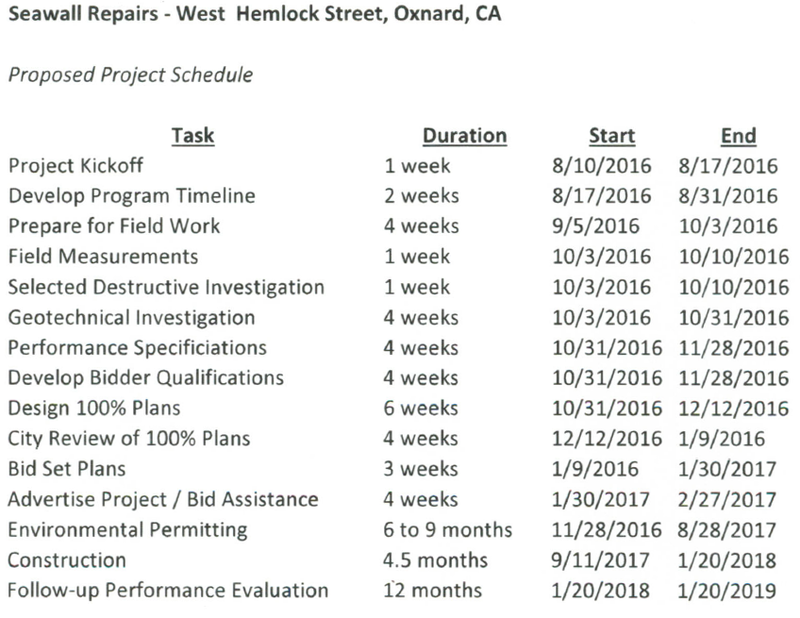 There are engineering design projects underway even though we still have not heard back ANY information regarding the solution to the long standing knowledge that our Assessment District does not collect enough money to fund the known repairs and maintenance projects that have been determined. Another maintenance project has also been added that involves the painting of the guardrails – many have paint flaking off exposing the treated wood. A note to homeowners: If you have your deck replaced and discover a void beneath it – please contact the seawall team! The good news is that are projects underway. Repair (50) of the worst condition pilasters prior to the corrosion damage destroying the tie-back rods which then require costly “shoring” to brace the wall during repairs. The pilaster repair plans which have been used in the past the plans were designed over 12 years ago and must be reviewed and updated to be permitted by the California Coastal Commission. While this projects is still a top priority – environmental permitting is required for all seawall repairs. A Pilot Program will explore using varying repair methods to identify the “best value solution” for future use on all Boise walls. Tests are being performed to analyze stress in pilasters and concrete, Geotech Drilling 20ft for analysis of soil pressure, concrete cores and compression strength, imaging of rebar. The data from the field work will be used to complete the design plans. The hope is that the follow-up performance evaluations will identify a best method to deploy for many areas of the overall seawall. 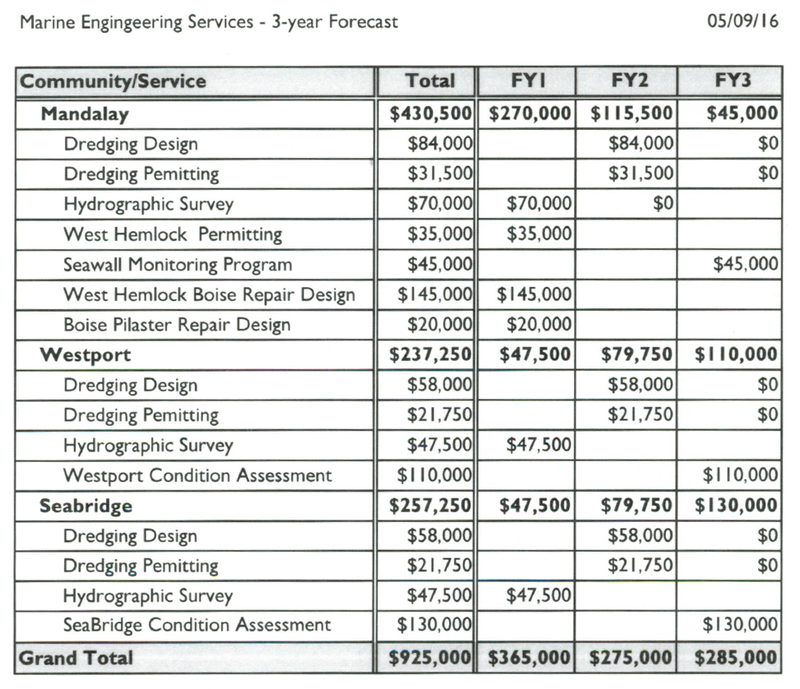 Included in the 3 year forecast below are numbers for all of the “north of the bridge” developments as they are a part of the Marine Engineering Services plan. Please note that these numbers do not include the “Landscape Maintenance” numbers. The first year of Mandalay bay includes ONLY Engineering and Design. The longer term projections are still unfunded. In 2014 underwater Vinyl Sheet Pile repairs were completed at (7) locations to protect the timber piling from Marine Borers. In 2014 low cost repairs completed to infill the gap on the top of the footing at (14) locations and between the slope protection (fabric and concrete mat) and the face of the footing at (5) locations.